The legend of King Arthur says that his lands are in Caroline in South Wales, where once there was a Roman fortress and an amphitheater. Centuries ago in this place were found ruins, which are supposed to be remnants of the majestic Camelot. Usk River flows in Caroline, which many believe that noble kings and queens from distant countries used to arrive in the legendary Camelot, with its golden towers. From high in the Welsh hills, the river passes through some interesting Welsh places, such as the city which gives the river its name, situated in the heart of South Wales. Usk River originates from the northern slopes of Black Mountain, in the western part of the Brecon Beacons National Park. Initially, the flow of Usk went north to Lake Usk, then east of Sennybridge to Brecon, then turns east and passes through small towns Talybont-on-Usk, Crickhowell with its interesting Crickhowell castle and Abergavenny. Further, Usk takes a southern direction and passes not only through the town Usk, but the Roman military castle Caerleon, in the heart of Newport, to reach the Severn River estuary, after Newport. One of the biggest attractions along the Usk is Newport Castle. The positioning of Usk in the Bristol channel and the 12-hour lunar cycle create unique conditions for the tide, which is considered the second fastest in the world after a similar surge in Canada. Every 12 hours the tide changes in such a way that the river Usk is empty one day and one day - swollen. 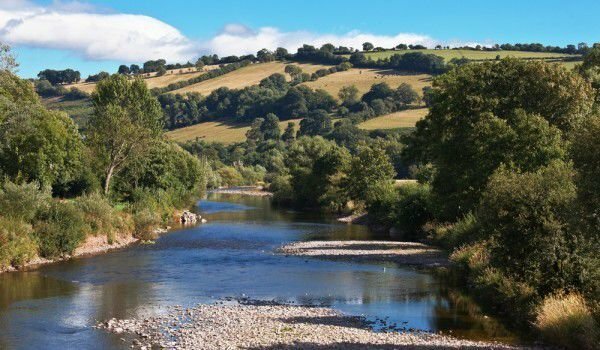 In the course of history, Usk River plays an important role in the events in South Wales, and to date the river is fundamental in many local tales and legends. The tides themselves are a prerequisite for the estuary to provide a great port for thousands of years. Trading vessels along the River Usk were operating in the early Middle Ages. Evidence for this comes from the remains of the ship Newport, discovered in July 2002. The ship dates from around 1465 and is evidence of the importance of Usk as an important water route in the past. The historic bridge over the Usk in Newport, known as Newport Transport Bridge, was built around built in 1906 and is considered the longest-surviving facilities of its kind worldwide. Usk River was declared a place of special scientific interest. In its course, Usk offers very interesting views and a variety of habitats – you can see lagoons, marshes, pastures and forests, etc. Flora and fauna along the Usk are extremely diverse. The river has long been known for its rich fishing opportunities for trout and salmon, but various other species live in it. The population of salmon in the Usk is granted with a particular focus - here you can capture huge 14 kilogram fish.